Renovated barn with private swimming pool on a family run farm in the Charente. La Ferme des Noyers (Walnut Tree Farm) is on the edge of a small peaceful hamlet, close to forest areas and open fields with a lovely view across our valley. The barn was originally used to shelter sheep over the winter period which dates back at least 300 years and is renovated to a high standard. The barn is the ideal accommodation for a couple or a small family with everything you need to enjoy your stay. An ideal environment for children of all ages, a calm and relaxing place for families and couples as well as the option to help on the farm. You will find plenty to do on the farm whether it be relaxing around the swimming pool, feeding and helping with the animals, playing various games including badminton, or table tennis, or maybe just relaxing taking in the tranquil surroundings and listening to the summer birdsong. Just outside the farm is a variety of walk ways through forest and sunflower fields and also cycle routes through the valley and neighbouring villages. Downstairs is an open-planned living area with a modern kitchen, dining area, and lounge area. Upstairs has a double bedroom, a twin bedroom, and a bathroom with a bath, shower, sink, and toilet. The kitchen facilities include freezer, fridge, microwave, washing machine, gas hob, electric oven, toaster, and kettle. The living room area has satellite tv, dvd player, a wood burning fire, and wi-fi. A clothes airer, iron, and ironing board are in the under stairs cupboard. The private fenced garden at the rear of the barn has a west facing patio to enjoy the lovely evening sunsets while enjoying the tranquil surroundings and listening to the summer birdsong. Table & chairs, barbecue, and a pétanque area are also found in the rear garden. The secluded swimming pool is next to the barn and has it's own private fenced terrace with sun loungers to enjoy the long summer days. There is also table tennis, badminton, small children's play area, and trampoline. Parking is to the side of the barn in the courtyard of the main entrance. Please Note : Towels and bed linen are included. Please provide your own towels for swimming and the beach. A high chair and cot/additional bed are available upon request. A thorough clean will be done for your arrival and is included in the price. We do ask you to please leave the gite very clean and tidy on your departure. The swimming pool area is checked daily. Before having children we spent many of our holidays in France where we fell in love with the Charente countryside, the people and the pace of life. We decided to sell off the family business and took the jump to purchase a small farm in France to live and work the good life. The view of the valley and sunflower fields on the other side of the valley from the kitchen window was what first appealed to us. We love the rolling hills, valleys and forests with its varied wildlife. The French people here are so friendly and will always stop to talk. We live on the edge of a peaceful hamlet, yet only 10 minutes away from two towns, so you get that remoteness feeling as well as the knowledge you are not far from nearby amenities. The farm is located in a valley where we can look down on all the live stock nearly all the time. We have now been here 11 years and are now a young family of 5. Although farming turned out to be a huge learning curve and much more hard work than we could have ever imagined, we are still enjoying the good life. We are so glad we made the move and loom forward to many more happy years here. We have just spent a week in Faye and Scott's very comfortable barn while we were house-hunting. The property is spacious and well equipped. It has a highly efficient log burner which heats the upstairs too - very useful in January. Amazingly, Scott provided us with wood throughout our stay. Both Faye and Scott are so friendly and helpful, providing us with support and advice on everything locally as well as on house-hunting and the French systems. The price was just amazing. Such good value. The animals are charming and this is a perfect, quiet retreat for families and couples alike. Wonderful place with 100% committed hosts to helping you to make the most out of your stay. Faye and Scott are the kindest people. 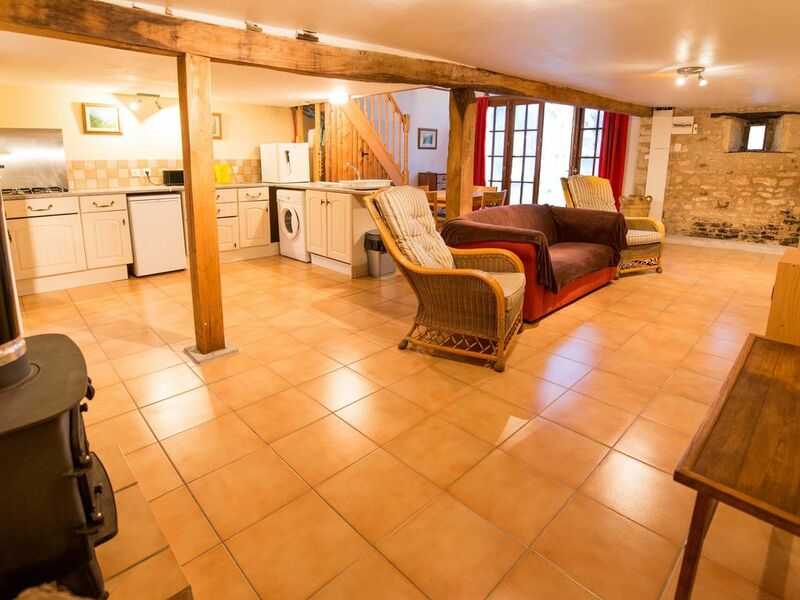 The Gite was sparkling clean - in spite of the rustic farm setting. Expect your day to begin with a serenade of roosters, donkeys, dogs! This is a working farm with an array of farm animals. Perfect for families with children, but even without, we had a great time. The location was excellent for day trips exploring the beautiful Charente region. We went to Tusson, La Rochelle, Verteuil-sur-Charente and other charming villages. We cannot recommend this place enough! Spent a week house hunting in the area and travelled over 1000 miles throughout the week. It was great to get back each day to such a relaxing atmosphere. Faye and Scott were the perfect hosts and went out of their way to help us with advice and guidance. The resident ram helped us to dispose of excess bread each day and we were given a guided tour to introduce us to the rest of the animals. The weather wasn't too good as it was early April, but that didn't matter because it was so relaxing and once we got the log burner fired up warm and cosy. Just got back from a short break at the Gite. Simply loved every minute of our stay. The Gite is situated on the farm and is equipped with everything you could possibly need, a real home from home. Faye and Scott are two of the nicest most genuine people you could hope to meet and made our stay unforgettable, along with Ethan, Kara and Leah, their three fantastic children. We were able to explore the beautiful region but couldn't wait to get back "home" to the farm to feed the animals (miss you Albert). I could go on and on but words cannot explain everything about this little slice of idyllic France. Many thanks again to Faye and Scott, and hope to see you again in the near future. Had a lovely time staying with Faye and Scott, despite the unusual snow and ice in the area. We arrived to a log burner going and food on the side at our request due to arriving after the shops were shut. We got to meet Babe, some goats etc... everyday we were out, Scott ensured the fire kept burning in the gite. For the money, it was everything that was needed and more... THank you both for letting us stay. Très bon accueil! Scott et Faye sont aux petits soins ;) Nous avons pu visiter la ferme et les alentours! Les enfants sont ravis de leur séjour, nous aussi !